Meet Mahashta Mûrasi, 179, an Indian man born in Bangalore in January 6th, 1835. 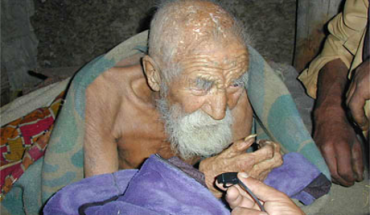 He has lived in Vârânasî since 1903. He worked as a cobbler in the city until 1957, when he retired at the already venerable age of 122. Mahashta Mûrasi who claimed all his grand-children have all died for years, explained that somehow death has forgotten him and that he has lost hope to die. Mahashta Mûrasi who claims he may be immortal now says that death may not kill him again claiming that nobody dies after 150 years. The man’s birth certificate and identity cards all seem to confirm his version, but unfortunately no medical examination can confirm his saying for now. The last doctor Mister Mûrasi visited died in 1971, so there is little information available about his previous medical files. Would you like to live that long?